In the previous post in this series, part 20, I showed a matrix multiplication to convert a value stated in guineas and shillings into one stated in pounds and shillings. We were interested in the same value, expressed in different units. The matrix used to multiply by is called a transformation matrix. Our starting point in that post was that values expressed in pounds and shillings can also be expressed in guineas and shillings, and vice versa. There is a way to show this graphically, and doing so gives an opportunity to show coordinate systems that are strange to many people: coordinate systems where the axes are not at right angles to one another. and it is completely valid to think of this as a coordinate pair based on the guinea-axis and the shilling-axis. Though the guinea-axis and the shilling-axis are not at right angles, it doesn’t take long to get used to those kinds of axes, and read values accurately in terms of guineas and shillings straight from the graph. What I think is genuinely confusing, and not just a matter of familiarity, is to write those coordinates as (4,3). This is confusing, since I might now think of that as 4 pounds and 3 shillings, which conventionally would also be written as (4,3). But that confusion arises from the (4,3) notational system, and would be absent if we were used to writing (4 guineas, 3 shillings) instead. It is useful to separate out these two things: (1) notational confusion, and (2) conceptual confusion. Notation confusion comes from common notations, like (4,3) which assume agreement on what the components mean. Conceptual confusion might arise from being unfamiliar with axes that aren’t at right angles with one another. 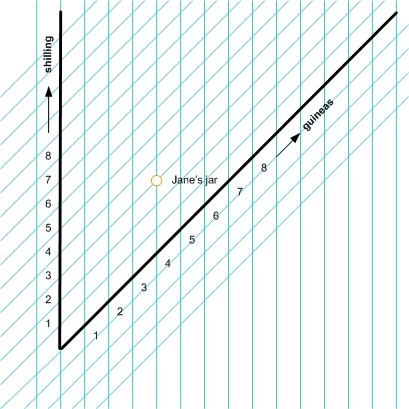 In the graph below, the “pound” axis is no longer explicitly shown, and values can be interpreted as having two coordinates according to the two coordinate axes shown: the guinea axis and the shilling axis. 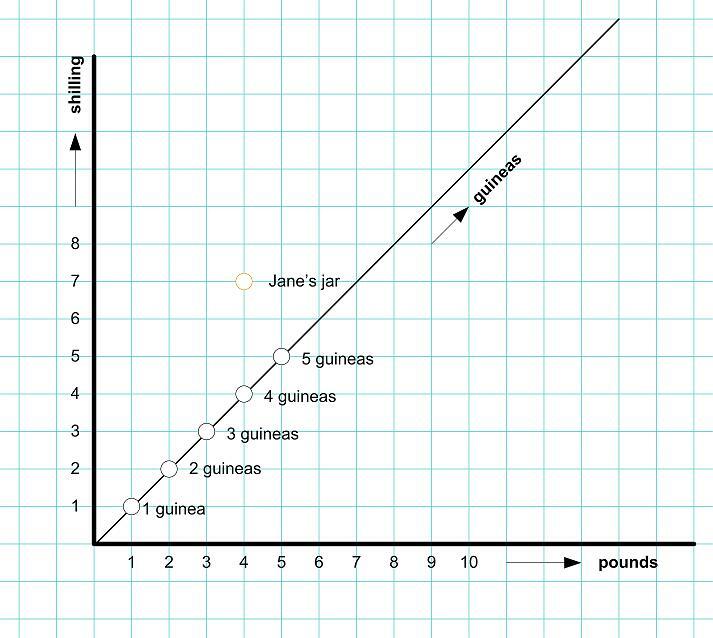 Compared to the earlier graph, the value of money in Jane’s jar shows up in the exact same place. If the graphs were drawn on transparent paper, and held directly one above the other, you would see the origin, the shilling axis, the guinea axis, and the Jane’s jar point all line up. The graph is a bit harder to read, but mostly because we aren’t as familiar with this kind of graph as we are with those where axes are at right angles. To read the coordinates corresponding to Jane’s jar, we would follow the grid lines (shown parallel to the axes) and see where they intersect the axes. The vertical grid line through Jane’s jar hits the guinea axis at the 4 guinea mark, and the not-horizontal grid line through Jane’s jar hits the shilling axis at the 3 shilling mark. Our preference for axes at right angles isn’t entirely arbitrary, but can still be seen as an inherited convention. When it comes to which axis is labeled the “x” axis and having positive values on the right and negative values on the left – most of us are clear that this is a convention, a cultural heritage, something you and I do simply because everybody else does it the same way. It is important to know and to honor those conventions, because deviating from these conventions risks having your graph be misunderstood by just about everybody else. Yet at the same time it is useful to be clear that there is no deep mathematical reason that requires “x” to point towards the right, or axes to be at right angles. There are consequences, though, for having axes at right angles, as there are consequences for having the scales on x and y axes be the same. If you are familiar with the standard equation for a circle (centered at the origin) as , where indicates the radius, you will likely also be aware that the circle will degenerate into an ellipse if the scale on the “x” axis doesn’t match the scale on the “y” axis. Additional distortions of shape will show up if you graph familiar equations (e.g. ) on axes like those on our guinea/shilling graph and expect to see the shapes familiar from school. Yet when we started out graphing pounds and shillings, our decision to show those at right angles is essentially arbitrary. Once we made that choice, the guinea axis showed up at a funny angle. There is nothing intrinsically “right-angled” about pounds and shillings. We could have started with values expressed in guineas and shillings and we could have chosen to represent those geometrically in a “normal-looking” coordinate grid based on guineas and shillings at right angles. We will follow this idea in the next post. This entry was posted in Uncategorized and tagged denominations, extending patterns, matrix multiplication, representations, whole vs. parts. Bookmark the permalink.